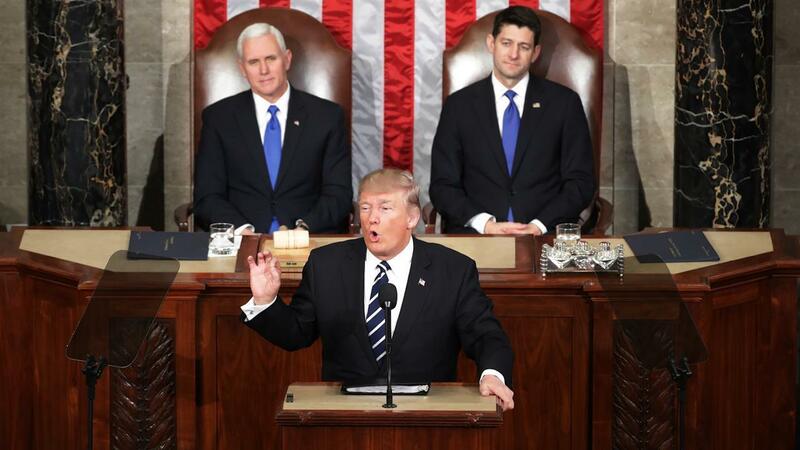 President Donald Trump projected a positive and unifying message in his State of the Union speech. However, controversies, including polemics of his own making, followed him into the House chamber. These were a reminder of the challenges the president faces in transforming rhetoric into real changes in his administration. Throughout the speech, Trump paid tribute to acts of courage, sacrifice, and heroism that exemplify “the beauty of America’s soul and the steel in America’s spine.” These mentions included Americans who responded to hurricanes, wildfires, and the mass shooting in Las Vegas. Furthermore, he referred to others who suffered losses of loved ones or who showed bravery. Moreover, Trump spoke about the economy and the achievements, which continued to grow steadily over the past year. The jobless rate is at its lowest level in 17 years and salaries have begun to rise. The stock market has set record after record, although the Dow Jones industrial average dropped 363 points on Tuesday after a big decline on Monday. The passage of the Republican tax cut has prompted companies to give bonuses to workers, announce new investments, and promise more jobs. The president also underlined conservative priorities that he and his party have jointly pushed in an effort to redirect the government. Trump pointed to a reduction in regulations on businesses and energy producers, to the confirmation of conservative judges and to his decision to move the US embassy in Israel to Jerusalem. The record he cited and the priorities he outlined drew enthusiastic applause from Republicans in the chamber. Democrats appeared unmoved throughout a large part of the event. Furthermore, there was an unspoken protest on the House floor among Democratic women in Congress. Most of them wore black to show solidarity with the #MeToo movement, as Hollywood women did at the Golden Globes awards earlier this month. Trump announced that he would keep open Guantanamo, reversing Obama administration policy and signaling a return to military detentions for captured terrorism suspects. Trump also proclaimed success in beating back the militant group Islamic State, while conceding that "there is much more work to be done." Additionally, the president called for bipartisan action on his administration's immigration plan, which would offer a path to citizenship for 1.8 million Dreamers. Also, he referred to the building a wall along the nation's southern border, and curbs some legal immigration. "A down-the-middle compromise," he called it. Those on both sides apparently disagree: immigration hardliners call the citizenship provision improper. There were scattered boos from Democrats when he extolled new limits on "chain migration," which allows legal immigrants to sponsor family members. Moreover, Trump condemned North Korea. He warned that Pyongyang's "reckless pursuit of nuclear missiles could very soon threaten our homeland. We are waging a campaign of maximum pressure to prevent that from happening." It is important to highlight that Trump only mentioned Russia once alongside China as a rival. Trump did not refer to the federal inquiry into whether his campaign was planned with Russia in the 2016 presidential election, a controversy that is dogging his presidency. No modern president at this early point in his term has addressed an American public that is so unhappy by his leadership. Trump has the lowest job-approval rating of any modern president at this point in his term, and it has been uncommonly stable. Since last March, Trump’s approval rating in the RealClearPolitics average of public national polls has consistently been below 45%. The disapproval rating has consistently been above 50%.